Ultiworld is pleased to announced the third annual Ultiworld Player of the Year. The award criteria can be found here — we considered both regular season and postseason performance in our selection of awards. Though the input of Ultiworld reporters is weighed heavily, final decisions for awards were made by the editors. The reason Jesse Shofner was selected as the 2016 Player of the Year is simple: no player dominated with the frequency and to the degree that Shofner did this season. In that category, she was simply unmatched. 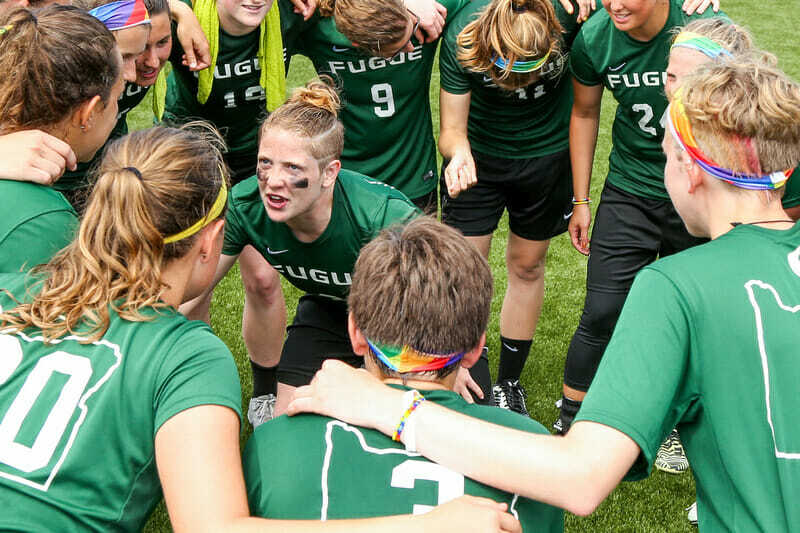 Her talents have been known for her entire career, but over time, she’s learned to control them, how best to use them, and what the effects of her choices on the field are. When maturity was added to direct the nuclear explosiveness of her game, Shofner was able to take complete control of possessions, points, and even games. The Fugue star also has a signature style, some parts enhanced by her team, but also some parts influencing it. The full throttle offensive attack is so recognizable and unique that there is no other college player even playing the same way. For the closest comparable, you have to reach to the club level, where you find nothing throughout most of the club division before arriving at Opi Payne. Obviously, that’s a high compliment. Shofner doesn’t wear her heart on her sleeve: she wears it in her cleats. Her passion churns out laser speed cuts and gravity defying bids. She’s an intense, physical, competitive one on one defender, a tremendous matchup who overcomes her lack of height with her athleticism, toughness, and grit. It seems like the only way she knows how to play. Last year’s Offensive Player of the Year has only gotten better, on both sides of the disc. Game-planning for Fugue always has to start with “How are we going to neutralize Shofner in isolation?” only to be quickly followed by “And how are we going to slow her down after the turn?” Nearly every matchup at Nationals failed to find an answer, which is one of the reasons she racked up 27 assists, good for 3rd in the division, to go with 7 goals and 6 Ds. That’s as a cutter on a team with four goal-throwing handlers that all tallied double digit assist totals of their own. But you don’t need numbers to see Jesse Shofner’s impact. You just have to watch. And when she steps on the field, time and time again, and changes the game, you know. Comments on "The 2016 Ultiworld College Women’s Player Of The Year, Presented By Nike Ultimate Camps"